Financial sector leaders raised hundreds of thousands of pounds for the most vulnerable children and young people supported by Barnardo’s, the UK’s leading children’s charity. The second Banking on Barnardo’s fundraising event, was held in March at London’s iconic Merchant Taylor’s Hall, and was an opportunity for the financial sector to come together in support of Barnardo’s and the causes it champions. The evening was attended by 240 leaders from the financial services industry who raised over £297,000 for the charity and follows the success of the first event in 2016. 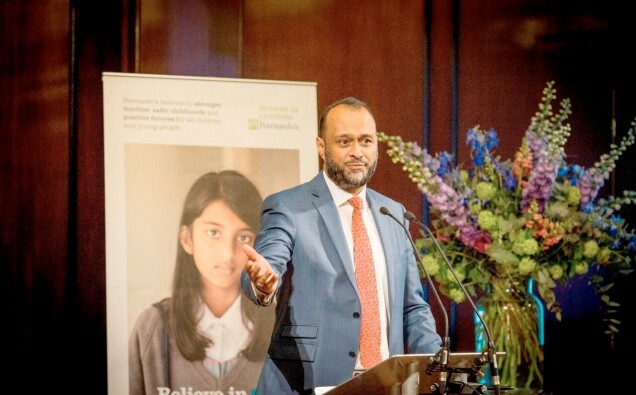 During the evening, Chief Executive of Barnardo’s Javed Khan thanked guests and described how money raised would go towards the charity’s vital Child Sexual Exploitation, Mental Health and Young Carer services, which support tens of thousands of vulnerable children, young people, parents and carers across the UK each year. He said:  “I’m extremely grateful for the generous sponsorship and donations we received tonight. “Barnardo’s supports children across the UK who have faced horrific trauma and abuse in their young lives. In 2017 – 18, Barnardo’s supported 2,600 children through Child Sexual Exploitation services and 32,200 children, young people, carers and parents through Mental Health services. It also supported about 3,500 young carers, who often shoulder huge responsibilities caring for a loved one, with some carrying out more than 30 hours a week of caring responsibilities* – almost the equivalent of a full-time job. To demonstrate how the funds raised will help Barnardo’s support vulnerable children, guests learnt about the amazing young people supported by Barnardo’s. Trisha’s** story was one of those shared on the night. She has been supported by one of Barnardo’s Child Sexual Exploitation services. She said: “Before coming to Barnardo’s I didn’t know what grooming was, I know what happened to me wasn’t my fault. “I could talk to my worker and say things I couldn’t say to anyone else. I now know what to look out for and it makes me feel safer. The event was hosted by newsreader, presenter and journalist Natasha Kaplinksy alongside keynote speaker Andrew Bailey, Chief Executive of the Financial Conduct Authority. To round off the evening of fundraising, comedian and impressionist Rory Bremner entertained the crowds with a stand-up comedy set. Mr Bremner added: “This was a really moving event; it is truly shocking to understand what some children and young people go through. “Barnardo’s helps to transform young lives and so it’s fantastic that so much money was raised to help do just that. The fundraiser was organised by Barnardo’s supporter and chair of the Banking on Barnardo’s committee William Chalmers, Managing Director Co-Head of Global Financial Institutions Group at Morgan Stanley, along with fellow committee members, Javed Khan, Chief Executive of Barnardo’s, Nathan Bostock, CEO of Santander UK, David Duffy, CEO of CYBG, and Alison Rose, Deputy CEO of RBS. Banking on Barnardo’s was also sponsored by international newspaper The Wall Street Journal and worldwide executive search firm Heidrick and Struggles. On behalf of the organising committee, Mr Chalmers said: “The work that Barnardo’s do is impressive and the issues it addresses are critical.